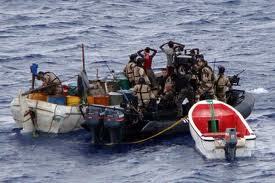 Piracy Is Not Just A ‘Business’ But A Lifeline In Somalia? Somalia’s central government collapsed more than 20 years ago, and now its landscape includes droughts, warlords, fighters allied to Al Qaeda, malnutrition, suffering and death on a scale unseen just about anywhere else. The United States and other Western powers are pouring millions of dollars into Somalia’s transitional government, an appointed body with little legitimacy on the ground, in the hope, perhaps vain, that it can rebuild the world’s most failed state and create an economy based on something like fishing or livestock. But the transitional government has been divided feckless and corrupt. Islamist rebels control much of the country. For years now, Somali pirates with fiberglass skiffs and salt rusted Kalashnikovs have been commandeering ships and taking hostages along one of the most congested shipping routes in the world, the Gulf of Aden, a vital conduit for Middle East oil to Europe and the United States. On February 24, Somali pirates struck again, attacking a Danish sailboat and snatching three children, along with their parents and two crew members. More than 50 vessels are now held captive in Somalia, from Thai fishing trawlers to European supertankers, with more than 800 hostages. A single hostage intentionally killed by these pirates had been almost unheard of, until February 22, when they shot dead four Americans in the Arabian Sea. It’s not clear why the pirates would want to kill the hostages when their business model, which has raked in more than US$ 100 million dollars in the past few years, is based on ransoming captives alive. Those numbers grow each year but the international response has been limited. Western powers, including the United States, have sent warships to cruise Somalia’s coast and discourage attacks. When a vessel is hijacked, ship owners raise a ransom, nowadays in the neighborhood of US$ 5 million dollars, and most of that cost gets passed to the consumers. 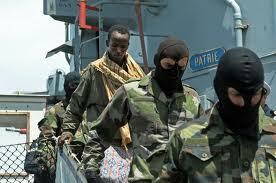 The pirates used to stick relatively close to Somalia’s shores. But now, using ‘mother ships,’ hijacked vessels that serve as floating bases, they attack ships more than 1,200 kilometers away. The red zone now covers more than 2.5 million square kilometers, an area naval officers say is impossible to control despite the patrolling efforts of 34 ships from 15 countries. Piracy establishment is a sprawling operation on land, too. It offers work to tens of thousands of Somalis, middle managers, translators, bookkeepers, mechanics, gunsmiths, guards, boat builders, women who sell tea to pirates, others who sell them goats. In one of the poorest lands on earth, piracy is not just a business but it’s a lifeline. And this gets to the real problem. Shipping companies are frustrated because while many pirates are apprehended at sea by foreign navies, the vast majority are typically released unless they are caught in the act of hijacking a ship, according to Cyrus Mody, manager of the International Maritime Bureau in London,.